As the holidays approach (or pass me by? Thanksgiving at a race track? What?) I find that I am getting behind in everything. Social engagements are starting to pop up, work is getting more intense and I’m sort of struggling to figure out how everything is going to get done. Last week I desperately needed to get my apartment cleaned and some cooking done….but it never happened. This wouldn’t be a big deal, except for the fact that not cooking meant I’ve had nothing to bring to work for lunch/dinner for the last couple of days. Since I dislike most of my food options near my job, it’s kind of an issue. Luckily, there is a Trader Joe’s a couple of blocks away and I’ve been able to rely on their ability to always have ready made salads available for us lazy/overworked/procrastinator types. 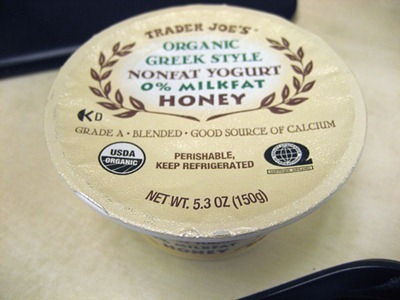 It’s no secret how much I love Trader Joe’s….their food is on my blog all of the time. Not to worry…I’m not being compensated in any way and I buy everything with my own money. I just really like their products! I was excited to find some new salads in stock on Sunday when I ran in to pick up dinner for both my Sunday and Monday shifts. Today I learned that when I photoshop pictures, I shouldn’t auto color. These pics looked great in Photoshop on another computer, but on my laptop, they’re horrible…. 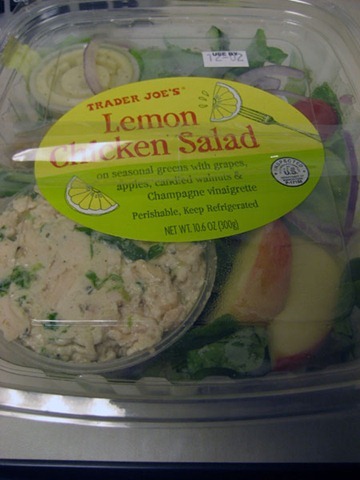 On Sunday I had the Lemon Chicken Salad and it by far surpassed my expectations. 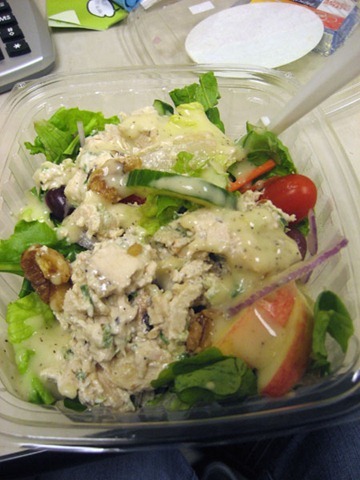 The dressing was flavorful, the vegetables crisp and the chicken salad itself was actually very good. 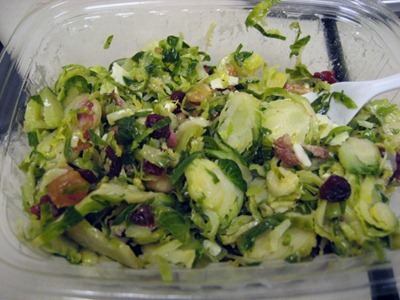 On Monday I had the Brussels Sprout Salad. Brussels sprouts and I have a new found love affair. After years of hating them I’ve reevaluated and decided that they may actually be one of my favorite vegetables. I mean, I have only been blogging for 3 months and they’ve already come up several times. I was a little apprehensive about having them cold, but I decided to have faith. The first couple of bites were a little strange, but I kept eating and it really grew on me. I had never eaten brussels sprouts chopped up like that…I always just half them. I liked it! The dried cranberries were really good in this salad too. That sweet really made the dish. I really love these new salads that have come out over the last few months. The one thing I don’t like about them is that now they’re calling each container 2 servings. 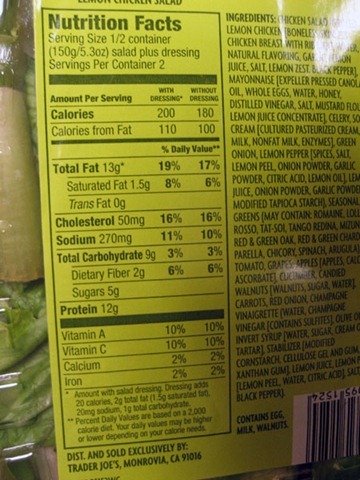 When I first started shopping there, their salads were low calorie and they were marked as only one serving. Now it seems that the same sized salad is for two. 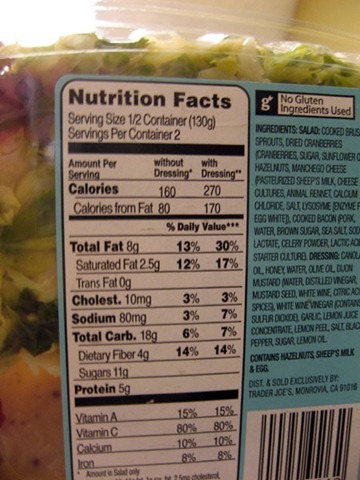 Some of the salads are not all that large either….no one is going to eat the brussels sprouts salad as two meals. Well, at least I’m not! 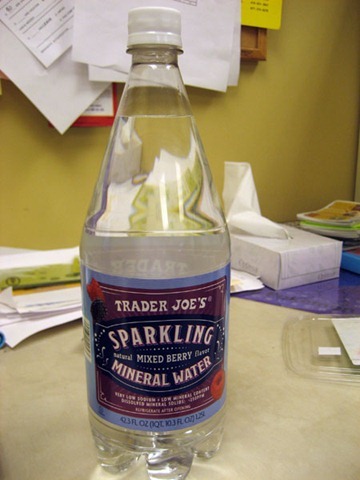 …the sparkling water I nearly shoplifted! It was an accident! You see, I didn’t grab a basket when I went into the market, so I tucked the bottle under my arm while I was shopping. I wandered around, gathered all of my items, went up to the register and put everything down to be paid for…except for the water. I pulled out my wallet, paid for everything and just as the cashier finished bagging up my groceries I realized the bottle of water was STILL UNDER MY ARM! I put it down on the counter and said, “Oh my god! I just shoplifted!” The cashier laughed, told me she hadn’t even noticed. I sheepishly handed her the buck and some change I owed and headed on to work. I really like salad, but get turned off by it because I can NEVER find the perfect dressing. You know, the kind that adds a bit of flavor but doesn’t take away…not really creamy, not too tangy…ugh. So hard. Suggestions? P.S. I’m jealous you have a Trader Joes near you!! Not to throw another TJ’s item at you, but I really do like their Champagne Pear Vinaigrette. You can also try just using a bit of balsamic vinegar….or a slight drizzle of olive oil with honey. Or you can use items in your salad that can act like a dressing….like I could’ve skipped the dressing with the chicken salad, as the chicken salad itself coated the lettuce and veggies enough to add flavor and keep it from being dry. Since you’re doing the vegetarian thing, you could try doing a Mexican salad with greens of your choice, black beans, greek yogurt (vs. sour cream), cheese, salsa and other veggies you have on hand. With the salsa and sour cream, you won’t need a dressing. Lots of options, though it depends on the salad and your eating preferences. Yeah…there are at least 3 in San Francisco that I know of, and another two or three within 15 miles. We also have Whole Foods…and lots of specialty health stores and co-ops. It’s one of the perks of living in a metro area. And now that I’ve said that, it has come to my mind that if you are jealous of me having a Trader Joe’s, you probably don’t have one and can’t get the Champagne Pear Vinaigrette. Brain fail. 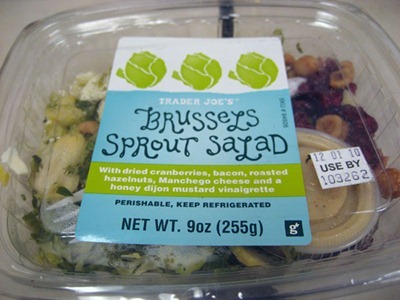 Wow that brussels sprout salad looks really good. Me and TJ might have to go into counseling and repair our relationship so I can try that salad.